Delivery done right! We have the equipment and talent to place product where you need it. Builders Supply delivery service is always free in the Omaha and Council Bluffs area. Conveyor Boom Truck: Have your roofing materials placed where you need it. Boom has second story residential roof reach capacity. 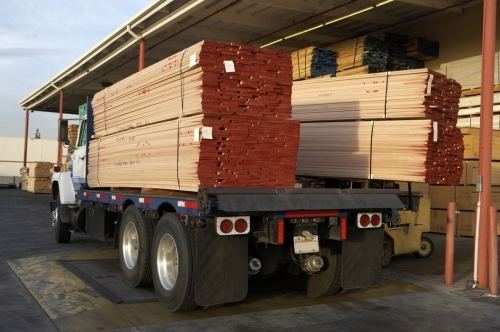 Tractor Trailer: We have the capability to deliver long span engineered wood products and large orders. Millwork Box Truck Delivery: Your new Windows, Doors, Cabinetry, Stairs and Mouldings are protected with box truck delivery service. Flatbeds and Flatbeds with All-Terrain Forklifts: All-Terrain Forklifts make product placement on challenging jobsites easier.